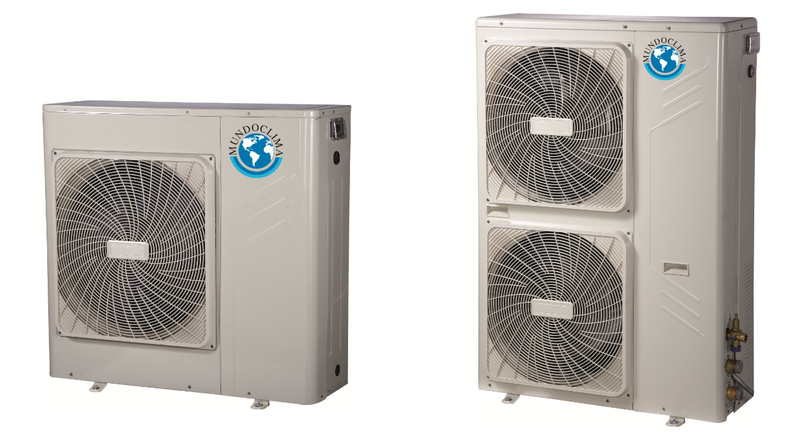 All range units incorporate a DC Inverter fan motor and a compressor, in this way performance is improved in middle frequencies and ensure a more sensitive and effective control. Module fully integrated and equipped with hydraulic components and expansion tank, plate-type heat exchanger and circulation pump. The plate-type heat exchanger is made of stainless steel AISI 316 to ensure high efficiency of thermal exchange. It is also equipped with an electrical heater and a pressure differential switch. Thanks to the electronic expansion valve (EXV) that maximizes performance and minimizes the impact of defrost. Precise and stable control of the refrigerant. The EXV control valve allows to adjust the flow accurately, monitor temperature and create an atmosphere of comfort. The MUENR-H4 equipments can operate in extreme temperatures, in heating mode up to an outside temperature of -15 °C and in cooling mode up to 46 °C. Thanks to the plate heat exchanger and high efficiency compressor and fan Inverter DC motor, power consumption is reduced and the unit operation is optimized. All series units incorporate an electronic control panel that lets you adjust all operating parameters. Moreover, in the models MUENR-10/12/14/16-H4, there is the possibility to connect a wall-mounted wire control (CL92340). Hydraulic connections Inlet/outlet water inch 1" 1" 1 1/4" 1 1/4" 1 1/4" 1 1/4"
(1) Conditions 1: Water inlet/outlet temperature: 12 / 7 ºC, outside temperature 35ºC DB. (2) Conditions 2: Water inlet/outlet temperature: 23 / 18 ºC, outside temperature 35ºC DB. (3) Conditions 3: Water inlet/outlet temperature: 40 / 45 ºC, outside temperature 7ºC DB / 6ºC WB. (4) Conditions 4: Water inlet/outlet temperature: 30 / 35 ºC, outside temperature 7ºC DB / 6ºC WB. (5) Measured 1m away from a semi-anechoic chamber (sound pressure level). (6) In models 10, 12, 14 and 16 wired remote control can be added optionally KJR-120F1 / BMK-E (CL92340). (7) The equipment controls the return temperature, so that the minimum temperature setting is 10 °C, 4 °C is for air outlet. (8) The equipment controls the return temperature, so that the maximum temperature setting is 50 °C, 55 °C is for air outlet.